I've always had a fascination with bees. It's hard to say what it is, really, but I think they are so cool. Maybe it's their diligence? The way they all work so hard towards a common goal? 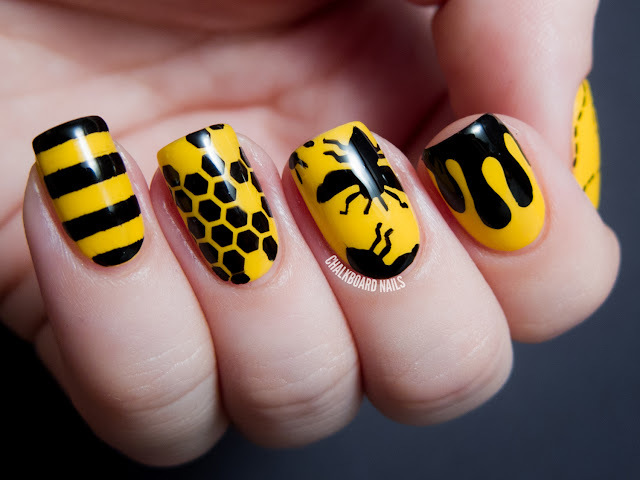 I've always wanted to do a bee manicure but have had trouble coming up with an original and interesting way to do it. For day three of the challenge, I thought I'd give it a shot. For the base of my nail art, I started with three coats of Zoya Darcy. I figured that the warm, rich yellow color would contrast nicely with the black accents I had in mind! 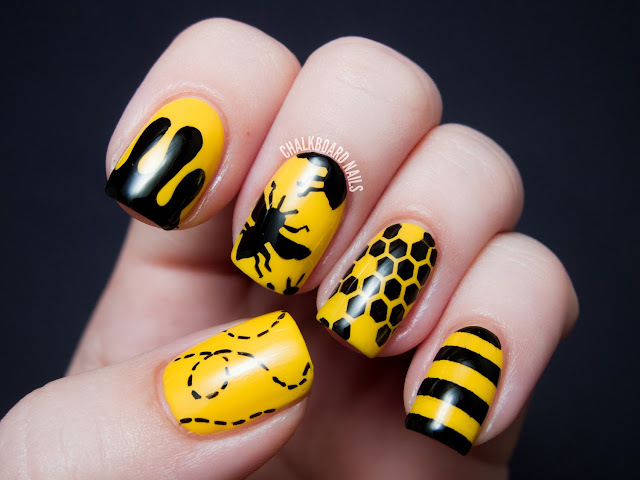 I freehanded the bee silhouettes on my middle finger. I used a short, thin nail art brush which allowed me to get fine lines on the legs and have better control over the rest of the body. I also freehanded the honey drips and the dotted fly-lines. The honeycombs on my ring finger are stamped with Vivid Lacquer plate VL002. The stripes on my pinky were done using a tape manicure technique. I loved wearing this manicure so much. First, I love yellow polish a lot and don't wear it as much as I should! Third, I think the bee silhouettes are some of the best freehanding I've ever done -- I'm so proud of the way they came out. My yellow nails from 2012! My yellow nails from 2011! so cool! I almost did the bumble bee today, but opted out. These are incredible :) I love the free handed bees so much! Wow, these came out so amazing. Bees are fascinating! This is fantastic! I thought the bee silhouettes were stamps until you said something. Great job! This is so bold! Love it! Wow, incredible! Do you have a picture or link to the brush you used for the bee silhouette by the way? My first thought when I saw those bees was "please please please tell me that's a stamp". Now I know they're not and I am dying of jealousy. This is ah-mazing and I'm giving you a standing O. You should be very proud! I was impressed at first glance, even before I knew you freehanded the bees. I LOVE this mani SOOOOOO much!!! Your free hand painting skills really are incredible! The details on the bees legs - wow! I love how vivid the contrast is in this between the yellow and black. Your free handing skills make me sick.... I can't even draw stick people! :-p this looks so awesome! Came out great - still would like it better with more of a shinny top coat showing. These are so perfect!!! Love them. These are so cool! And your freehand skills are simply amazing!! this is beyond stunning (no pun intended?) 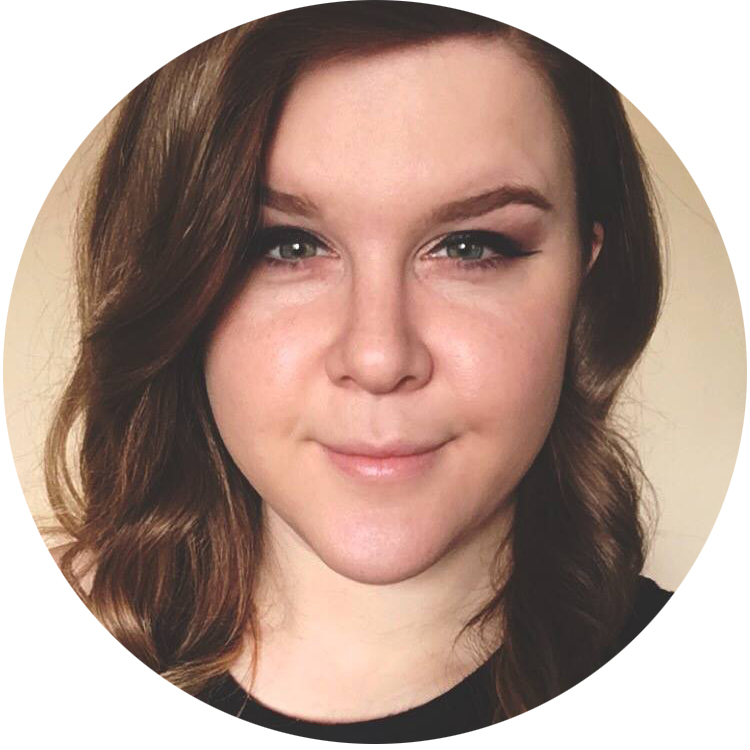 - some of the best art i've seen you do! I love this, it looks amazing! 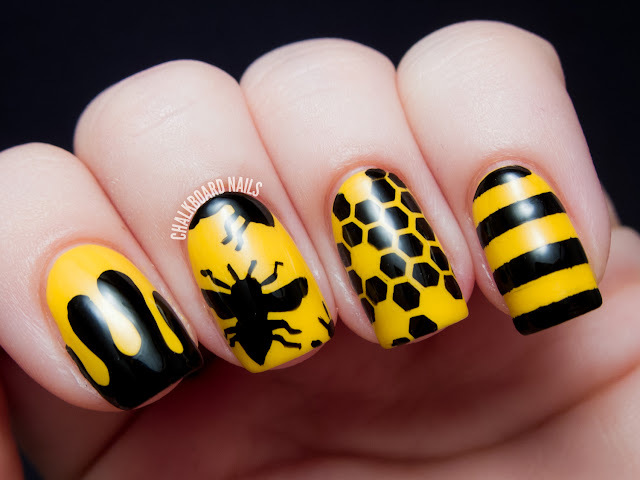 I can't believe you freehanded the bees, they are amazing! Such a brilliant design. Wow! Wow! Wow! Great nails! 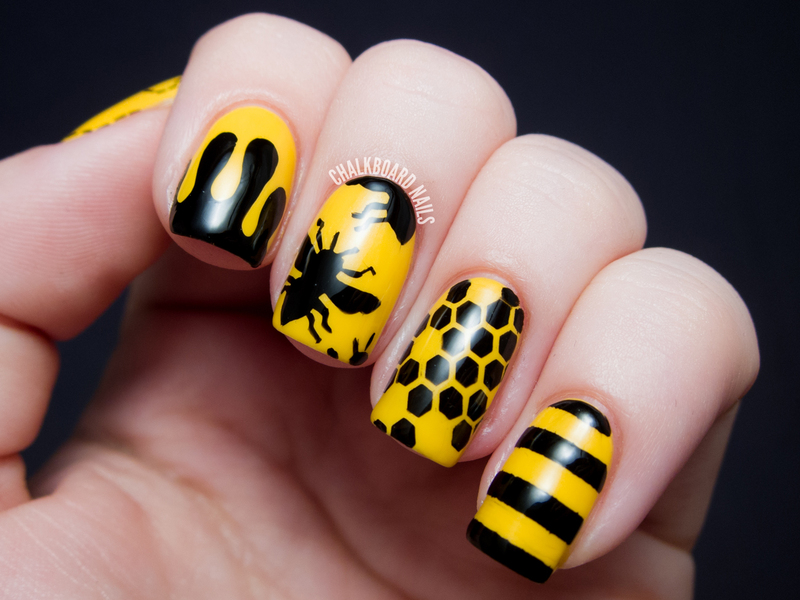 Haha oh god if I had done those honeycombs freehand, we would be looking at a very different (and uglier) manicure. Wow, that's so cool! My dad once let a beekeeper use some of his land for hives, and that was so interesting to me, so growing up with beekeepers must have been amazing! Thanks Cathy! I agree, this yellow worked perfectly in the manicure. Haha I love a good pun!! great job! These look amazing! Yaaay your bees came out so well. Also, I was massively relieved when I read that you stamped your ring finger hahaha. Wow so flawless & beautiful! I admit that I always scan the photos before I read the text on nail blogs (blush) and I was convinced that this was stamping. The bees and especially the honeycombs have such CLEAN edges. It's incredible! Awesome work!! I absolutely love this!!! My brother passed away when I was in high school, but he used to keep honey bees and for years after he was gone, when the weather got warm in the spring our garage would smell of honey. I have a very special place in my heart for honey bees, and this is absolutely lovely. How neat, what a wonderful tribute to your brother that must have been. :) Thank you about the nails! I was in the mood for yellow today and ended up with a bee manicure myself. Mine aren't nearly as pretty as yours though... I just don't know how you do it! i wish there was a tutorial on this! love it! This is so cool. Awesome work. Came across this looking for pics of bees.